Join our experts and learn how StorNext is even more powerful with StorNext 6. Quantum has truly taken the industry’s #1 workflow storage system and added stunning new capabilities to optimize workflows and enhance collaboration. Register now and see how StorNext 6 can help you outpace new performance requirements for 4K and beyond, consolidate resources, and streamline operations through an open-system storage platform for media workflows. Join Jermaine Harrell, Manager of Video IT Operations, Complex Networks and Quantum's Jason Matousek as they discuss Complex Media's transition from print to an all-digital media company. From balancing cost and content access, to hybrid environments and an archive strategy, the teams worked together to find the right solution that bolstered the creativity of Complex Networks so they could continue producing the content their large audience enjoys. In the Media & Entertainment world, productivity and performance can mean the difference in revenue, project completion and overall success. As file sizes increase, teams grow, and production timelines get tighter, having the right storage and network solution in place are fundamental in the foundation of your business. Join this webinar to learn how your current network may be slowing down your bottom line, or costing more than it needs to. Cloud has quickly become a huge storage topic...so why are the world's biggest clouds using Tape? Learn why Tape is ideal for long-term storage, how the role of Tape is changing, and why your enterprise should take advantage of Tape in the same way big Clouds do. You will hear from Eric Bassier, who has been a member of the Quantum Product team for over 17 years. During his tenure, he has served in roles such as Director of Product Marketing and Director of Product Management. He has the led the efforts to better integrate tape storage with Quantum's scale out storage software, defining and releasing unique features for archive storage use cases. Die neuen Backup Appliances – DXi9000 und DXi4800 – ermöglichen leistungsstarkes Multi-Site Backup und DR für Unternehmen und verfügen über branchenführende Speicherdichte und Effizienz. Ines Wolf, Presales Manager CE, zeigt Ihnen die Neuerung in diesem Webinar. Quantum vient de lancer ses toutes dernières appliances de sauvegarde DXi, le DXi 9000 et le DXi4800. Ce sont les appliances de sauvegarde les plus efficaces jamais créées au niveau logiciel comme matériel offrant une meilleure performance, densité et évolutivité. Regardez ce webinaire en français animé par Stéphane Cardot, Directeur Avant-Vente EMEA Quantum, pour en savoir plus sur les nouvelles appliances et comment elles vous permettront de protéger vos données plus efficacement. Join us to learn how we've made an award-winning file system even better, Quantum's StorNext 6.2. Ransomware is just one of the many threats that can impact your business data. With the use of cloud storage and virtualization expanding, and with a +500% in attacks and +600% in new variants, NOW is the time to ensure you have a proactive backup plan. Join Veeam and Quantum to learn how to set up a solid BCDR (business continuity and disaster recovery) and backup strategy to protect your virtual data against any ransomware and cyber security threat, including some lessons learned by our customers. Tape is as relevant as ever, but it may not be for the reasons that you think. In fact, as part of delivering hyper-availability, one best practice is to use tape as an “offline” storage copy to protect against ransomware and malware, which is a key part of a comprehensive data protection strategy. In this webinar, join experts from Veeam and Quantum to learn about tape’s role in tomorrow’s infrastructures, best practices for tape in a Veeam environment, and to introduce Quantum’s new converged tape appliance for Veeam – which makes it easier to create tape to protect against ransomware. GDPR becomes enforceable on May 25 2018, and affects all companies with customers in the EU. Learn about the new legislation from Stephane Estevez, product manager at Quantum & Kevin Ridings, alliances systems engineer at Veeam. They will explain considerations for GDPR and data backup including retention, security and protection. GDPR will become enforceable in 2018 - Quantum and Veeam's solution for data backups will help ensure you are ready for successful compliance. Ines Wolf von Quantum und Matthias Frühauf von Veeam zeigen Ihnen, in einem gemeinsamen Webinar, die wichtigsten Auswirkungen der DSGVO und bewährte Verfahren für die Datensicherung einschließlich Vorhaltung, Sicherheit und Schutz. Das Webinar gibt Ihnen die Gelegenheit, mehr über die Regulierung zu erfahren und wie SIe die neuen Lösungen von Quantum und Veeam nutzen können, um die Einhaltung der Verordnung zu gewährleisten. Le RGPD est entré en vigueur en mai 2018 et impacte toutes les sociétés qui ont des clients au sein de l'Union Européenne. Pour décrypter les bonnes pratiques, assistez à ce webinaire présenté par Stéphane Estevez, Product Marketing Manager chez Quantum; et Pierre-Francois Guglielmi, Systems Engineer chez Veeam. Ils expliquent les incidences du RGPD en matière de sauvegarde, notamment pour la rétention, la sécurité et la protection de vos données. Découvrez comment les solutions de sauvegarde Quantum & Veeam peuvent vous aider à vous conformer à ce nouveau règlement européen. La technologie NAS d’entreprise traditionnelle ne suffit plus à subvenir aux besoins croissants des environnements de données critiques actuels. Xcellis® Scale-out NAS, reposant sur StorNext®, est la première appliance de stockage pour workflows capable de relever ce défi. Ses performances sont plus de trois fois supérieures à celles des offres NAS d’entreprise concurrentes et, à capacité et performances équivalentes, son coût est dix fois inférieur grâce au stockage multiniveau intégré. Lors de ce webinaire, découvrez comment Xcellis Scale-out NAS a été conçu pour répondre aux besoins des entreprises : performances et capacité évolutives, gestion simple et flexible, gestion des niveaux de stockage et des coûts. Join us to learn about storage for video and media customers. Join Quantum and JB&A in learning about storage for video and media customers. GDPR becomes enforceable in 2018, and affects all companies with customers in the EU. 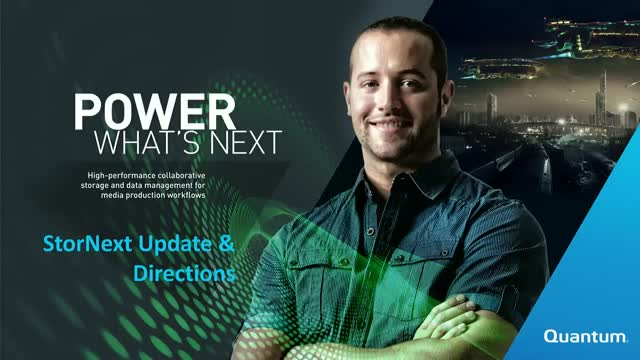 Learn about the new legislation from Stephane Estevez, product manager at Quantum & Ronn Martin, solution architect at Veeam. They will explain considerations for GDPR and data backup including retention, security and protection. GDPR will become enforceable in 2018 - Quantum and Veeam's solution for data backups will help ensure you are ready for successful compliance. Learn about the features of the latest linear tape-open data storage technology release - details about changes to the technology, specific cost of ownership comparisons versus proprietary tape, and the future road map for development. The latest release brings enhancement to capacity, performance, error rate, material, cost of ownership, and diversification. LTO advancements complement Quantum’s Scalar® libraries, offering an excellent solution to address today’s big data challenges and replace end-of-life proprietary tape systems. Kick off the new year with a new webinar series designed just for video surveillance partners. Each 30-minute session will cover a number of topics including product updates, key wins, Quantum resources, and more. Grab a lunch and together we’ll tackle storage tidbits in easy, consumable, bite-size chunks for busy people like yourself. Ths webinar is presented by Quantum and TV Technology. Artificial Intelligence (AI) is beginning to make substantial inroads into modern media production workflows, primarily by automating a range of repetitive tasks. This webinar reports on a recent survey conducted by TV Technology and sponsored by Quantum that explores how media companies are using AI today, and specifically about how they are managing content storage, retrieval and metadata management in an industry driven by relentless growth and increasing pressure to post first on social media. - Validated reference architecture - designed & engineered to Commvault’s specs. - Scalability of the solution as your environment grows. - ROI based on current customers who have already implemented this solution. Quantum’s SureStaQ for Commvault averages less than $200 per TB at scale, learn how to save costs on your storage and simplify your Commvault backup. Ines Wolf erläutert Ihnen die sechs Gründe, warum LTO-Tape in der nun achten Generation an die Spitze der besten Enterprise-Lösungen aufgestiegen ist: Kapazität, Performance, Fehlerrate, Material, Betriebskosten und Diversifikation. Die neue LTO-Technologie maximiert die anerkannt führende Effizienz der Scalar® Libraries von Quantum und macht sie zur besten Lösung für aktuelle Big Data-Herausforderungen sowie beim Austausch veralteter proprietärer Tape-Systeme. Informieren Sie sich über die Features der neuesten LTO-Version, spezifische Betriebskostenvergleiche mit proprietären Tape-Lösungen sowie die künftige Entwicklungs-Roadmap. We're global experts in scale-out storage, archive and data protection. It's all about providing end-to-end storage solutions for the most demanding workflows. For more info, check out Quantum.com, Stornext.com and follow our storage experts at blog.quantum.com.